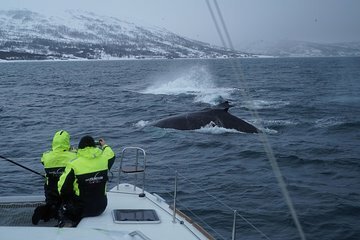 Set out on a thrilling whale watching tour off the shores of Norway's Tromsø, above the Arctic Circle. Board a luxury catamaran for an exciting adventure across the sea, seeking out majestic whales who often come right up to the boat. Watch the below waters from the catamaran's open net or choose to do your viewing from an outdoor or indoor seat. When you're not viewing marine mammals be sure and take in your scenic surrounds,filled with snow-capped mountains and fjords.